September 21 is my six year anniversary writing this little old blog (I hope it buys me flowers)! Blogging has changed so much since I started six years ago and while I truly love what I do, the friends I’ve made, the amazing opportunities I’ve had and the ability to be my own boss, I’m feeling overwhelmed. It has seemed to become more about who can get their seasonal home tour up first and less about living in the moment. More about self promotion and less about supporting other bloggers. More about copying trends and less about being unique. More about pretending life is perfect and less about being real. This year, I decided not to host my annual Eclectically Fall Home Tours. 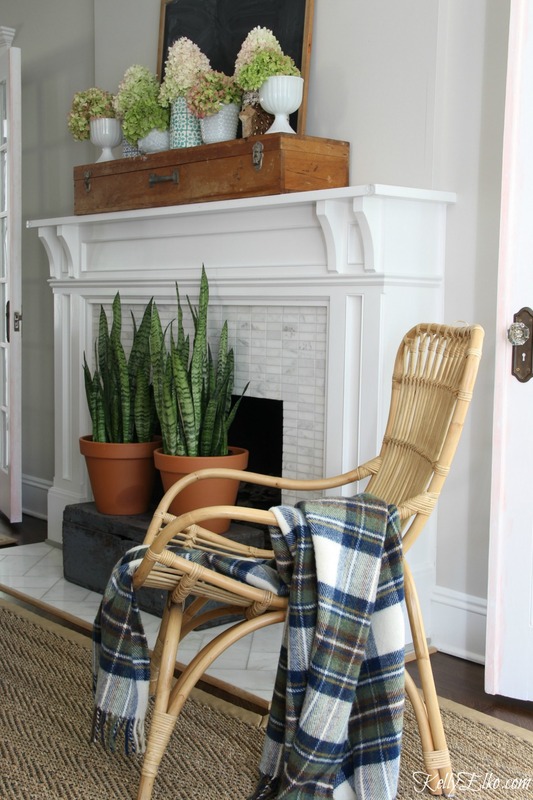 Don’t worry, I’ll still be decking out my house for fall but I won’t be linking to other bloggers on the same day because I want to do things in my own time – not in a mad rush to be first. It feels good to go back to the good old days of creating when the mood strikes. My new mantra is KISS – “keep it simple stupid.” My fall mantel is the perfect example. 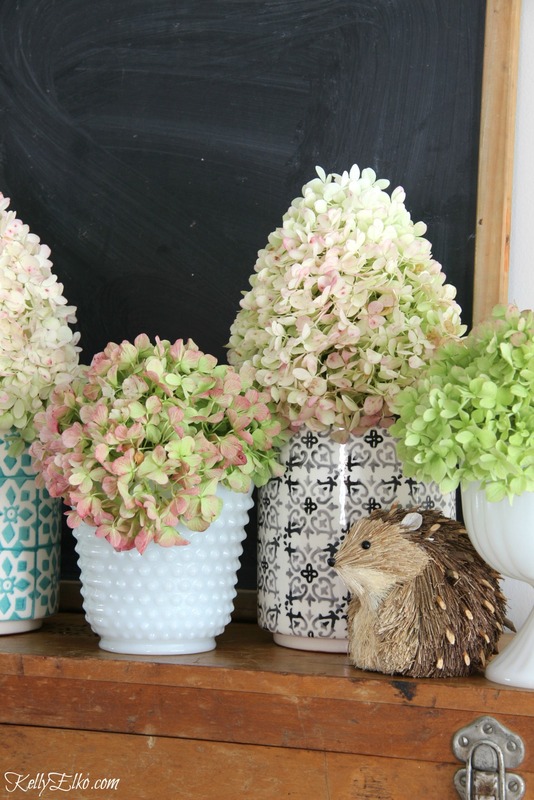 Hydrangeas from my yard (the conical flowers are Limelights and the round ones are Endless Summer. 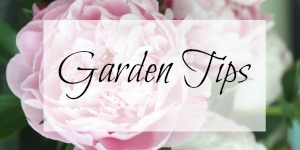 If you love hydrangeas as much as I do, make sure to read all the tips and tricks I have for growing different kinds of hydrangeas here. Tip: use lots of the same thing for quick and easy decorating. 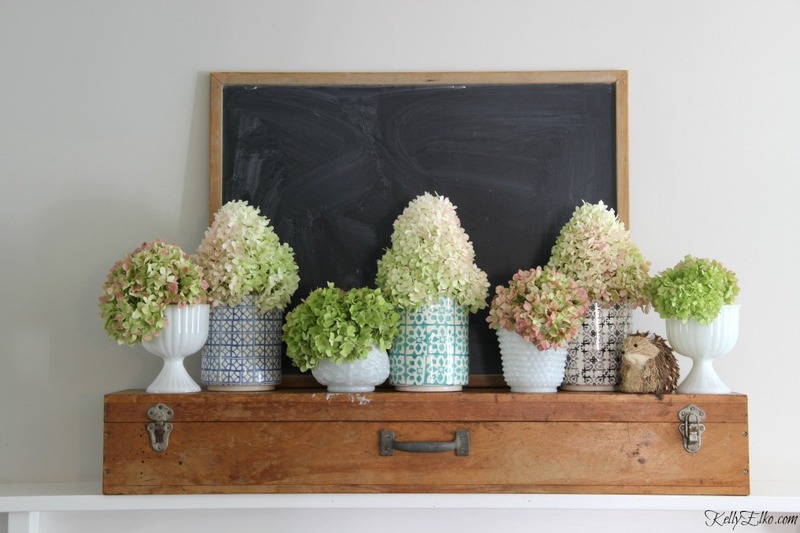 Whether it’s flowers or a favorite collection, if it’s displayed together, it has bigger impact. Today, there was a nip in the air as I walked Sushi around town. It felt good to enjoy the beginnings of a new season. Here’s to living in the moment and taking time to smell the hydrangeas. I agree that blogging has changed and not for the better, in some cases. I also follow Cassie Bustamante’s blog and she has adopted the retro-blogging stance for the same reasons you listed. I like the sound of retro-blogging! Yes I’m friends with Cassie! I think retro-blogging should go viral! First I would like to say congrats on six years of hard work. I have always loved your work. That’s way I joined your site. More to come and I can’t wait. Thanks so much Mary – that’s 42 in dog years! LOL Pat – I’m happy to have you stop by any time! KISS!!! love it!!! keep up the good work!!! Congratulations! I love hydrandgeas so much. Thanks Eileen they are my favorite flower tied with peonies! i think you know how i feel about this- YESSSSS. on the same page and then some!!!! 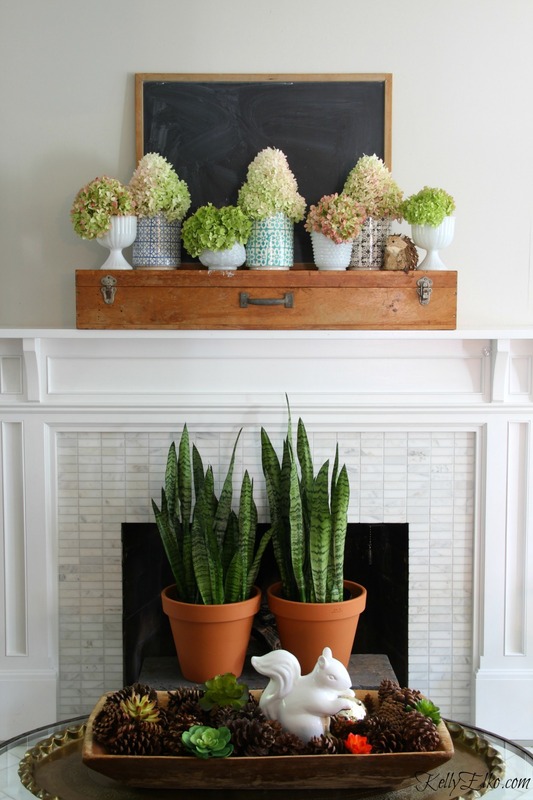 love the mantle- those colorful printed pots are so fun! Hi Kelly! I have always loved your website since the moment I happened upon it! I applaud you for your stance on living in the moment and enjoying. I love your eclectic style always!! Happy Fall! I couldn’t agree more, Kelly. Although I don’t have my own blog, I have followed various ones for several years – or used to anyway. Some of them are just too much and make me, the reader/follower overwhelmed as well. I like a “less is more” approach, so kudos to you for stepping back a bit! By the way, your hydrangeas are lovely! Have a blessed day! I love this… the KISS method…I gotta keep this in mind for everything in life. Congrats on 6 years of blogging!!! Let do the next 6 in our own style!!! I subscribe to several blogs and must admit I am thinking of unsubscribing because of the very reasons you mention. I don’t understand why they want to be ahead of every season and also they seem to be following the same trends and trying to outdo each other. I retired from North Carolina to a tiny island off the north coast of Scotland and started looking at blogs as a reminder of ‘home’ but am not sure about continuing. I will continue your page as I feel you and I are on the same wavelength and I look forward to seeing more of your ideas. ? I’ve followed you since you spoke at a blogging conference in Raleigh back in 2012. Blogging has changed a lot since then and not for the better. I’ve already made a few changes in my blog outlook and do not intend to follow every trend that comes down the road. Love your KISS philosophy. Congrats on your anniversary and on the fresh state of mind. I find that I spend less and less time reading the very few blogs I subscribe to. Its my experience that too much of the blog space is hawking some wares, doing the same old, same old, or projects that apply to very few of us. I look forward to your posts. Sometimes i think decoration is a little too much but, i think yours is perfect and i am ready for Fall. Mornings are cool here in Okla. too, you can just feel the crisp cool air. I love your new mantra. Its wonderful to decorate because the season is here not super early. Love the flowers. So simple and pretty. Your home always looks amazing in every season!! Have a wonderful day Kelly! I love that you are doing what you want to do in your own time. Life is about the journey, not the destination. I agree with the other comments that the blog world has changed and not for the better. I have always enjoyed your blog very much and it/you will always stay on my ever-shrinking read list. 😉 Your personality and style are fun & relatable and it never feels like you are being paid to tell us something. Even if you are. 😉 Keep up the great blog and congrats on 6 years! Kelly, I agree with you 100% about the blogs. Their are very few, like yours, that are unique and inspiring! Everyone seems,to have the same decor. I think they all order off the same sites. The vintage, collected, farmhouse is not want I am seeing and miss. I think bono has made a,comeback because of the uniqueness of the decor and color! I personally do not like all white and live with color in our home which we enjoy. I hope to see a swing of the pendulum or more readers will move to IG…in my personal humble opinion. Thanks for not,going with the trends! I think your style is beautiful. I love the simplicity of it, and the colors and textures. Thanks for letting us into your home. Kudos to you!! Life is meant to be enjoyed and not to always be rushing through it. This is a lesson I am learning over and over again, but maybe each year I get a little better at it. Has it really been 6 years???? Oh my how much life has changed. I hope you can really enjoy this Fall Season and the seasons to come. Your blog will continue to be spectacular and entertaining as always. 6 years of blogging is 42 dog years! I just got back from a little family getaway to FL – no computer in sight! Enjoy your fall, your junk and your family too Karen! I commend you for your healthy approach! I, too, have noticed the commercialization of several of my favorite blogs. When bloggers constantly tout products — I feel that they lose their objectivity. It becomes more like a commercial rather than a unique blog from a creative person. Thank you for remaining untainted! Well I do still love to ship Mitzi! The struggle is real LOL! 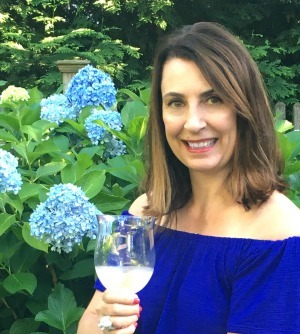 I like to share sources and fun finds – I hope to be authentic when I do so. Thanks for the comment – I appreciate it!